Tabouleh is parsley salad worth its weight in gold. Each individual ingredient needs personal, painstaking preparation. Cutting the vegetables is an art form. This is another dish I learned during my time in Haifa, from my roommate Naifeh. We would have tabouleh days, and the girls would sit around together, methodologically chopping ingredient after ingredient. Tabouleh, alternately spelled tabbouleh or tabbouli, is one of those dishes that everyone loves to claim. I can see why — it’s good. The Lebanese consider it one of their national dishes, Palestinians also stake a claim and I’m sure that if I were ever to have the opportunity to talk with a Syrian, they’d have something to say on the matter, too. But the lovely thing about food is that it’s not a zero-sum game — we all can own it. Naifeh comes from a Druze village in the Galilee, an Arab-speaking community with its own distinct religion that considers itself neither Arab nor Palestinian, with roots here that go back 1,000 years. Her family is full of proud career officers and Knesset members. This is her family recipe. What makes this dish such a point of pride is the amount of work involved. You can’t cheat by using a blender — it simply won’t work. I had an ex-boyfriend who didn’t believe me, and he wound up with parsley pesto. May that serve as a warning to you all. Working alone in my kitchen, it took me about an hour to prepare a one-liter bowl’s worth. Needless to say, this is not an everyday dish, but sometime it’s nice for a treat. A good tabouleh is also quite an impressive dish to bring to a party or a picnic around here, and for good reason. Obviously, you can save time by not being quite as pedantic about finely chopping the vegetables. A note about the parsley — when I say one big bunch, I don’t mean a little plastic case from the herb section, but one of the loose bunches whose stems you barely can fit your hand around. I’m talking about those massive bunches that weigh nearly 200 grams, with long stems that are more than 30 centimeters/a foot long. At certain times of the year the bunches are smaller — it depends how well parsley is growing — so you might need two bunches. In peak summer, my parsley bunches weighed only 100 grams, for instance. Also, the two cucumbers are Israeli cucumbers, not American cucumbers, meaning they’re approximately the length of your hand and a little thicker than your thumb. First, set aside the bulgur to soak, covered in warm water. First, start with the parsley (see photos). Holding by the stems, rinse well, and remove any yellowing leaves. Now, grip the stems tightly against a cutting board, as close to the base as possible. Remove and discard the dried out tips (but preserving as much of the stems as you can — this is the base of the dish). I usually hold the bunch of parsley between my thumb and forefinger, knuckles against the cutting board and fingertips bent back toward the leafy tops. The idea is that you want to hold the parsley as firmly as possible, and as close to the cut end as you can. With a very sharp knife, start shaving off minuscule layers from the parsley stems (as in photo). The closer your hand is to the end of the bunch, and the tighter you’re holding the parsley, the more control you’ll have, and the smaller your parsley bits will be. Continue all the way up to the leaves, until the entire bunch has been turned into a mound of green sprinkles. Press the knife into the bunch, especially the leaves, to make the parsley bits even smaller. When everything is as finely chopped as you have patience for, toss into the bowl. The green onions and mint are relatively easy to chop. Chop the green onion into thin rings, and go over it a few times with the knife. Likewise, chop the mint into thin slivers and go over it a few times until well minced. Toss into the bowl. Now for the cucumbers and tomatoes, which are a big more involved (see photos). Remove the tip of the first cucumber and slice into the top, making parallel cuts, but no deeper than the knife blade goes without losing control (you don’t want to detach the cucumber slivers from the cucumber quite yet). Now, make cuts in the other direction, to make a fine grid. The cucumber should resemble a bristled paintbrush. 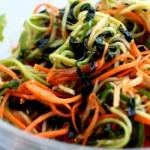 Put the julienned cucumber top against the cutting board, and as with the parsley, shave off thin layers of cucumber. You should be getting very fine cubes. When you make it through the cucumber strings, repeat the “gridding” step. 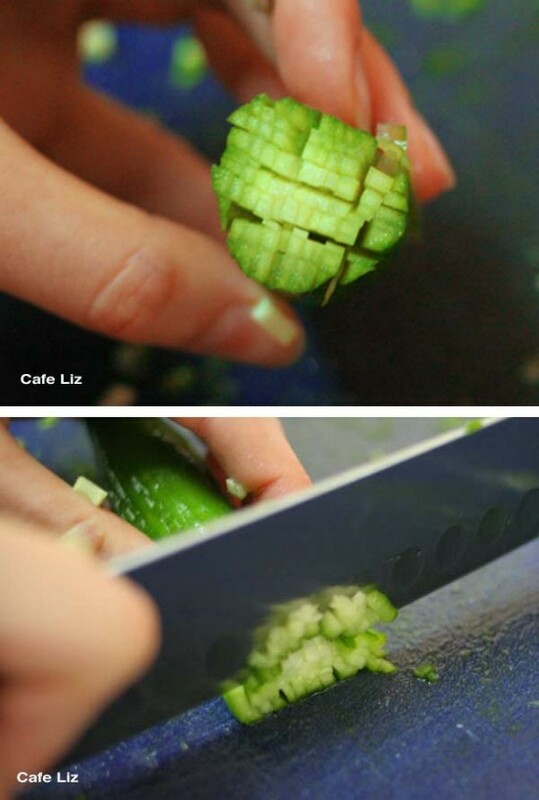 Chop all the cucumber this way, and toss into the bowl. You want to try the same thing with the tomato, but it never works quite as well — I always find that my tomatoes wind up too mushy to chop this finely. The sharper your knife, the less mushy your tomatoes will become. This is what I generally wind up doing: Slice the tomatoes in half, then slice each tomato half into thin strips. Gather the strips, and chop them into small pieces. Toss into the bowl. Now that all the vegetables are chopped and in one place, it’s time for the seasoning. 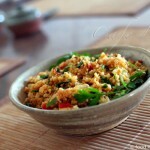 Drain out the extra water from the bulgur, and then mix the bulgur with the dry spices. Add the bulgur to the vegetables, and toss with the olive oil. At the last minute before serving, add the lemon juice and salt to taste (or let every person add his or her own salt). To squeeze the lemon without a juicer: Squeeze it into the palm of your hand, catching the seeds while letting the juice drip between your fingers. 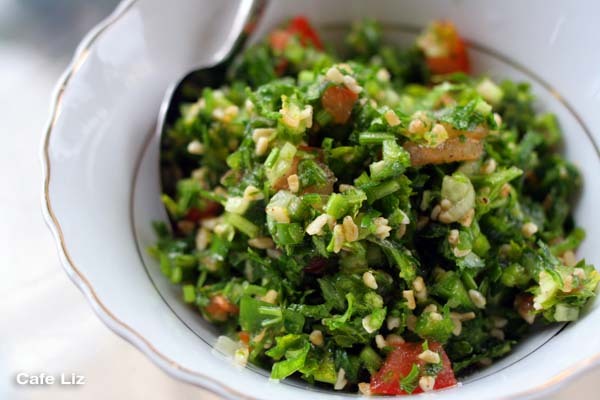 6 Responses to "Tabouleh — chopped parsley salad"
Great Pictures! Did someone help you with taking them? + I’ve tasted your tabulleh once, it was delicious! Thanks! Yes, Eitan took all the photos in which my hands appear. i’m making this on friday! hehe i can confirm a syrian will say tabbouleh is theirs!! 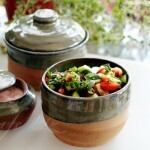 i find ultimately at the end of the day what varies are the addition of some ingredients, for ex here you use cucumber. i grew up on a cucumber-less tabbouleh. some add onions, others dont. etc etc. either way, no matter how you make it, there are no short cuts in preparing delicious tabbouleh! !